Snuppy and Prof. Hwang Woo-suks Research Team. August. 04, 2005 03:13. by Young-Dae Park sannae@donga.com. 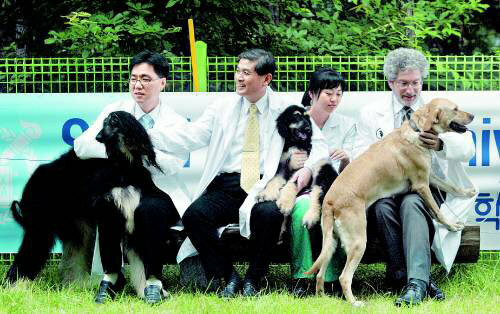 Snuppy (middle), the worlds first cloned dog created by Seoul National University professor and stem cell researcher Hwang Woo-suk and his team, the male somatic cell provider (left) and the female (right) dog who gave birth were revealed to the public on August 3. The research team includes, starting from the left, Prof. Lee Byeong-cheon, Prof. Hwang Woo-suk, researcher Oh Hyeon-ju and Professor Gerald Schatten at the University of Pittsburgh School of Medicine.